In the early eighties buying an Edwardian or 1930's house meant an upsurge in people people scouring the local antiques fairs and junk shops. They would be looking for little curios that would help capture the ambience of the bygone era and display as ornaments. Old household appliances suddenly had a new lease of life. The dangers of asbestos would have never entered their heads and probably not with people getting their hands on these curios to this day. 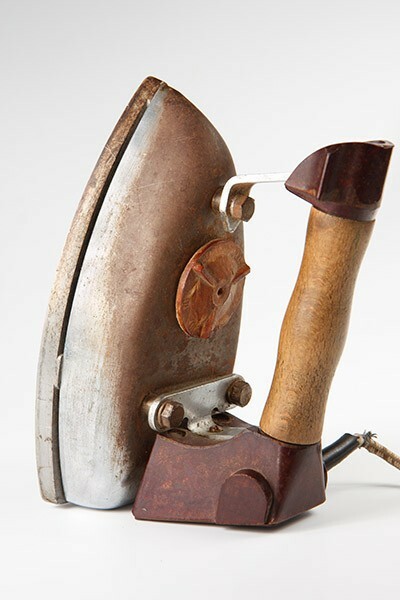 They are typically the old iron which can be adapted to become a doorstop, old radios, coffee pot, hair dyers, clothes dryers, ironing boards and iron rests. Whilst not representing a danger if left undisturbed the minute some of these are handled, dismantled or in the case of electrical items switched on then they become a lethal hazard. Old hair dryers are the worst because of the asbestos insulation enclosing the heating element. The heating elements were often soft and friable which meant when switched on they release fibres into the air. As you can appreciate if anyone has these and turn on for Friable asbestos was also contained in the wire insulation. Wear and tear makes the wires fray and have the potential to release fibres. There are still a lot of junk shops around containing items from house clearances and asbestos could be lurking so ensure you seek advice before buying.